Hardback. With a Foreword by Dame Sybil Thorndike. 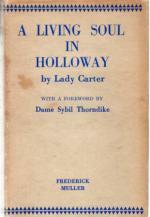 Lady Carter was a weekly visitor to Holloway Prison for 15yrs, and for 10yrs an organiser of the County Branches of the Discharged Prisoners' Aid Society. Her book is a picture gallery of women and girls in prison. Both as an account of prison life and as an analysis of the character of the so-called criminal this is a fascinating book. No less interesting is the description of the work done to help the unfortunate women and girls, and the effect on them of reformative and educative treatment. Chapter headings include : Down and In; Through the Glass Doors; Hungry; "Swell Mob"; "No Fixed Abode"; Y>P's; One False Step; Recidivists; Convicts; Free and Out. With Epilogue. 154pp. 12mo h/back. Lightly browned edges, Nr. F. in lightly marked, sl. sunned Vg. pcdw.